Perhaps there are plenty of photos and advertisements in French magazines for this delightfully-named car from the early 1920s – but to find a colour advertisement in Britain is, we would suggest, rather unusual. SA des Anciens Établissements Secqueville-Hoyau produced cars from 1919 to 1924 in the small town of Gennevilliers, north-west of Paris (now a busy suburb). This March 1920 advertisement was therefore a confident step into the British market in only the second year of production. The business was founded in 1911 by Alfred Secqueville and Gaston Hoyau as a producer of aircraft engines and propellers. They ran a modern, well-equipped factory during World War 1, building aero engines under licence, to Hispano-Suiza and Bugatti designs. There has been some speculation that their subsequent car designs may therefore have been influenced by the Bugatti engineers with whom they worked. Before the end of the war, their chief engineer Porney designed a light car of high quality, almost certainly influenced by the tight tolerances and rigorous production standards inherited from aero engine manufacture. The car was powered by a 1244cc 4-cylinder side-valve engine with aluminium pistons and tubular connecting rods and a 3-bearing crankshaft. The 4-speed gearbox was in unit with the engine, and electric starting was provided – unusual for a light car at that time. Also unusual for a light car was the range of body styles offered: 4-seater tourer, 3-seater torpedo (the style in our image? ), saloon and coupé de ville, the latter on the longest of three wheelbases of 94, 106 and 114 inches. 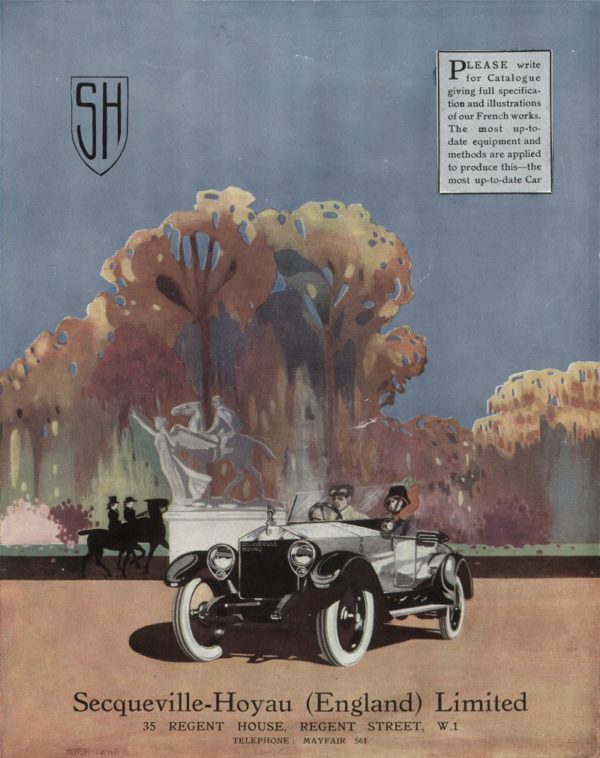 All the cars had stylish wire wheels and a Rolls-Royce-shaped radiator with the Secqueville-Hoyau name proudly displayed on the matrix and the SH monogram on the surround above. The challenge for all this excellent quality lay in the price. While comparable light cars were being sold complete at 13,500 to 15,000 francs, a basic chassis for an S-H at the Paris show in 1919 cost up to 12,800 francs, with a complete saloon costing 21,400 francs. Our British advertisement holds just a few clues to the ambitions of the company. It chose colour advertising. It mentioned in the box, top right, its French works with ‘the most up-to-date equipment and methods’ to produce ‘the most up-to-date car’ – a clear link to the standards established during aero engine manufacture. Sadly, total production was only 600 cars, with only 80 made in the last year of production, 1923, and a few being sold off from stock in 1924.